A group of four women who each both sing and play the kantele and who write songs in a consistent and original style, Kardemimmit have their roots in the folk tradition but are not afraid to season their menu with whatever spices take their fancy. Few ensembles can boast having made music together from childhood through to turning professional. In recent years, Kardemimmit have been in demand from the USA to Japan. Kardemimmit – Maija Pokela, Jutta Rahmel and Anna and Leeni Wegelius - met at the Juvenalia Music Institute in Espoo, where they all studied kantele with Sanna Huntus. In 2000, when they decided at the tender age of 9 to 11 to form a band, Juvenalia was one of the few places where young musicians could specialise in folk music. “Folk music was our thing from the word go, although we enjoyed playing any and all kinds of music,” says Leeni Wegelius. “Our teacher also encouraged us to write our own music from the very first,” continues Anna Wegelius. Do things change when you have been making music together for so long? In 2004, the four made their first visit to the Kaustinen Folk Music Festival. They describe the experience as intoxicating, featuring powerful performances for instance by Väsen and Värttinä. The young musicians grew up under virtually identical musical influences, listening to the same records each in turn. Today, they have somewhat diverged in their musical profiles. Nevertheless, it was in folk music that all four of them sought professional training, studying the kantele at the Sibelius Academy and the Centria University of Applied Sciences. 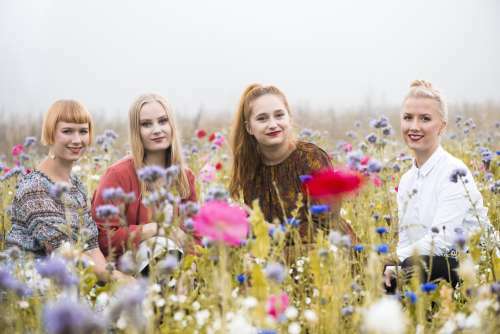 Now they also have other interests besides their original quartet: Maija Pokela plays with Enkel, Jutta Rahmel has a solo career, and the Wegelius sisters have both been working for the Finnish Kantele Association. Kardemimmit principally perform abroad, having appeared for instance in the USA and Japan; gigs at home are less frequent. They have toured the USA on several occasions, performing at venues as diverse as small-town schools on the one hand and huge festival arenas such as the Chicago World Music Festival on the other. The instruments played by Kardemimmit include small kanteles and the large concert kantele. Each of the members plays several types of kantele during any one performance. “It’s a bit like alternating between manual and automatic transmission when driving a car,” the Wegelius sisters explain. One question that they get a lot is whether they play anything else besides the kantele. It is easy to overlook the fact that ‘playing the kantele’ means proficiency on several very different instruments: small and large kanteles, which can each be played from the short side or the long side. Today, the group usually travels with one large kantele, played by each member in turn. Kardemimmit have released five albums; the most recent one, Kesäyön valo – Midnight Sun, was released in spring 2018. All four women write music, and their lyrics are a mix of original and traditional. Kardemimmit create their arrangements as collaborative efforts, which according to them gives their music the distinctive Kardemimmit sound. Most of their songs are rooted in genres of folk music, being identifiable for example as polskas or waltzes, but their melodies and harmonies owe a lot to the pop music genre. They create a striking ensemble singing in parts over the scintillating tones of the kantele, but each one of them sings solos too. Their vocal sound is also influenced by modern pop music. “A little while ago we listened to our first album after a long pause,” says Leeni with amusement. “It sounded so prog! Maybe we’re a little more down to earth now.” “We’ve economised our output. We no longer feel compelled to cram all possible ideas into a single song,” notes Anna. In conversation with Kardemimmit, it does not take long for the talk to turn to the roles of women. A band of four young women hears all sorts of things on tour that men hardly ever come across. People wonder how their husbands allow them to go on the road for so long, or else they assume that the sound engineer, a man, is the leader of the group. In the experience of Kardemimmit, even today young women are treated dismissively in the music business, though they be just as professional as anyone else. Reflections on womanhood run through the repertoire of Kardemimmit like a scarlet thread. There are plenty of tragic stories about women in folklore. As an example, we may mention Häpeään joutunut tyttö [The disgraced girl], originally a Hungarian folk ballad, performed in Finnish on the third Kardemimmit album. Today, they call the song Angoli Borbala after its main character. But if a traditional song feels uncomfortable, Kardemimmit feel they always have the option of adding lyrics of their own to shift the focus of the story. And it is possible to enjoy the music even if the symbolism of the folk poetry remains somewhat opaque. In 2018, Kardemimmit will be performing at the Kaustinen Folk Music Festival, and in October they perform around Finland on a tour organised by the Finnish Folk Music Association.